6 Quick Tips: Are you ready for Hurricane Sandy? Disaster & Rioting: Should you BUG IN or BUG OUT? One of the first recommendations I made when first writing about urban survival was how great headlamps are. Though they are more commonly used for hiking, climbing and cave exploration, the ability to have both hands free makes a big difference. Even though “tactical” lights have their place and a small LED light can be invaluable, one thing I learned from my years of irregular electrical power supply was that when the lights go out frequently you just have to get on with your life in spite of it. This means preparing food, washing the dishes, cleaning, working, fixing stuff, and while a bigger and more powerful flood lamp can come in handy, a headlamp that puts light exactly where you want it simply works better and is more efficient in terms of batteries. These days we see tons of “tactical” flashlights, some better than others, most of them made in China, with acceptable standards of quality though nothing to brag about. Petzl on the other hand is a company that mostly makes climbing and cave exploration gear. The thing about climbing equipment is that if it fails, you die. Its that simple. If your Petzl harness comes apart, its bye-bye. 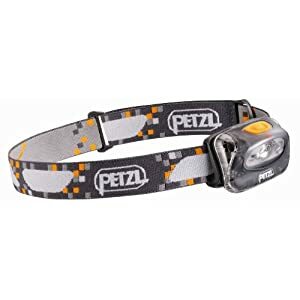 If your Petzl headlamp fails while climbing down a cave you’re done. Because of this, Petzl is a company used to high technical standards. This reflects in the quality fo their products. I’ve had an old Tikka for about a decade. Used it, dropped it, threw it around, then dropped it another thousand times, the thing keeps working. The Tikka Plus 2 has that same pedigree. It has three white LED modes, high, economy and strobe and then by keeping the button pressed for 2 seconds it changes to red LED with two modes of its mode, constant on and strobe. The headlamp used three AAA batteries. Its also water resistance and I’ve used it hiking while raining with no problem whatsoever. If you’re looking for a quality headlamp that is affordable and will last for decades, look no further. As Sandy gets closer, people rush to buy bottled water and batteries. Hopefully you’re not one of them but if you are, here’s the skinny on the situation. 1) Stay informed and evacuate if mandatory. No material possession is worth risking your life and the life of your loved ones. Call your family NOW. Lines may go down for days, so let at least two family members know where you plan to be, if you’re staying or not. It may be several days until you communicate with them again. 2) If you are bugging in, put up your hurricane shutters. If you don’t have any then an “x” of good tape across the window glass will help stop it from shattering too bad if it gets broken during the storm. Only you know how good of a shelter your home is, the general advice is not to underestimate the situation. 3) Remove any objects from your yard that may fly off, maybe against your own windows or yourself! Lawn chairs, toys, anything that could be dangerous if thrown at someone at high speed must be secured indoors. 4) Hopefully you’re not just now running to the supermarket and you already have your supplies. Have at least a gallon of water per person per day, have enough for seven days (authorities recommend a 3 day minimum). Store food that doesn’t require refrigeration as the power is likely to go down. Choose food that requires no cooking for this same reason. 5) Charge cell phones, laptops and rechargeable batteries now. Check your rechargeable batteries as some of them lose power on their own as time goes by. Get any dishes or laundry done now. Throw a few bottles in the freeze so as to keep the fridge food cold if the power goes down. 6) Have your basic supplies ready. Blankets, LED flashlights, batteries, disposable cardboard plates and cups to make dinner time easier. Given that you may not have water or electricity, this avoids the problem of washing the dishes. Make sure you have a radio (and batteries) so as to stay informed. Books, cards, board games and toys keep kids entertained, no need to waste power on ipads or Tv sets. Sandy will be hitting tonight, so good luck everyone! Feel free to comment here on how things are going around your neck of the woods. I thought you might get a kick out of this. Really sad. Have a good day. Yes, several people emailed the news to me some time ago. I’m so sorry to hear that Argentina lost the “ARA Libertad” Flagship. Libertad means Liberty in Spanish, pretty ironic. You know, I’ve been inside that ship twice. It used to be docked in Puerto Madero, Buenos Aires, and it was open to the public. I took my kids about a couple years ago. Before that we visited it with my family and an American friend and his family who came to visit, someone I knew through the website. It was one of those things that I wanted my kids to get to know before leaving Argentina. I had several of those, some I got to do, others we just ran out of time. It seems that the sailors were disgusted by the way in which the president said they could keep the ship, as if she didn’t care. I’m sure she doesn’t. Anyway, pretty sad and shameful, like getting your car repoed, but on a national disgraceful vent. I wonder; will other countries some day go through similar things when they can’t honor their debts? When the topic of Bug out vehicles is brought up, the most common denominator is large trucks or 4x4 off road vehicles. Its as if bugging out means mandatory travels through uncharted trails in the rain forest of Ecuador or fording the nearest river. I happen to see things a bit different in this regard. When it comes to “Bug Out” vehicles, reality tends to be far less exciting and we learn that instead of going Indiana Jones in the nearest national park you’re more likely to be driving on a paved road stuck in traffic for hours as everyone tries to bug out at the same time. In this case, a reliable car with good gas millage makes more sense than a 30 year old EMP proof car. I also like to make the distinction between Bug Out Vehicle (BOV) and SHTF vehicle (SHTFV). While a BOV is for getting you from your current location to a separate other destination during a crisis or emergency, the SHTFV is a car you use both for bugging out if required but also on more mundane, ordinary tasks. It’s the car you use during long term SHTF events were everyday life goes on, but there are more challenges and demands on regular basis. For daily use or for evacuating, I’m a firm believer of what you have with you may be all you have during an emergency. That’s why your SHTFV should be a viable BOV if needed, besides an everyday driver. Its like a handgun in terms of defense: Its far from ideal, but the ability of being there when needed makes it of great importance. You may have 5 minutes to evacuate, or 5 seconds. You may leave for work and when you go back home there’s nothing there left for you and your family, not even the BOV you had fully stocked ready to go, and you’re stuck with your Prius because that’s what you used everyday so as to save on gas while the BOV 4x4 truck sits waiting until zombies attack. I’ve said it before and I’ll say it again, you wont get emails or text messages notifying you of SHTF events or other disasters. It just happens, and when it does what you have with you may be all you have to work with. 1) Affordable: If I cant even buy it, then everything else matters little. The price of spare parts and repairs should also be within your financial means. This is the Achilles heel of most MOD/military vehicles. 2) Toughness: By this I don’t mean military style or hard use off road, but tougher than the ordinary sedan vehicle. Most light SUVs would fill this role well. The SHTV may be pushed into service for moving around gear, furniture, supplies, etc. More capacity than a basic car would be nice. Besides, during disasters and even due to economic factors, roads may be in far from adequate shape. This I’ve seen it myself very clearly. Well paved roads require more care and maintenance than most people realize. After a year of neglect roads are noticeably worse. After a decade of neglect you really need a truck or SUV unless you want to constantly replace tires, rims and suspension. Yet another point is security. Here I’m talking both about car accidents or having to push your way out of carjack attempts, who may cash against you on purpose so as to force you to stop your vehicle. A more solid vehicle is advice in either case. 4) Commonality: This will mean easier to find spare parts and more mechanics that know how to fix your vehicle, or more literature available to learn to do it yourself. A vehicle that is more of an oddity will present greater challenges. If imports ever stop or become too expensive for your pocket, you may have to rely exclusively on the second hand and used spare parts market. The more popular the model, the most likely you are to find what you need. 5)Gas millage: The chosen vehicle must have good gas millage for two reasons. First, a car with poor MPG will rarely be used, this means its less likely to be in use when needed. Ideally, this vehicle would be your daily driver, used for commuting, taking the kids to school, etc. Second, if you ever have to evacuate and use it as a BOV, it will be able to cover more distance with whatever amount of fuel you have left or are able to come up with. An extra 5MPG efficiency may be the difference between getting to your evacuation location with your supplies or hardly getting close to it at all. 6) Ground clearance and AWD capability: I’ve been caught by roadblocks, protests or other forms of disturbance or civil unrest more times than I care to remember. People in first world countries just don’t have that sort of experience. It was years of dealing with that, sometimes three or four days a week. What I learned was that a)I want a vehicle that can go up the curb, over the sidewalk, bulevard or off road so as to escape trouble b)I want AWD so as to not get stuck while doing so. 7) Big enough but not too big: While the vehicle has to be big enough so as to carry people and gear, as well as have the mass so as to push an average sedan to some extent if needed, the vehicle shouldn’t be so big that its difficult to maneuver and squeeze through places so as to escape and avoid trouble. Everything you need and nothing you don´t. For me, this boiled down to the Honda CR-V. It´s boring reliable if taken care of and fills nicely most of what I had in mind. The article called “How to Destroy a Rich Country” written by Mike Konrad, explains how Argentina is a case study of bad politics and corruption. Here’s part of the article, follow the link to read the rest. The next election may determine where America is headed -- to a restoration of its greatness, or to a retreat into the obsolescence of history. Before one casts a vote, an example stands before us of a country that made the wrong choice, warning us what to avoid. The country is Argentina, chiefly unknown to most Americans, apart from its creation of the tango . This ignorance on our part is inexcusable, since Argentina resembles an America that went awry. Argentina is a little less than half the size of the continental United States, with a climate that runs from polar in the south to tropical in the north. Most of Argentina's land mass is in the subtropical belt, where one finds the pampas -- arguably the best beef- and grain-growing region on the planet. The warm extended growing season gives Argentina an advantage over our cooler Kansas and Nebraska. There are times when Argentina has exceeded the USA in cattle product exports, and this production has been going on for over a century. Its grain exports are enormous, and much of the planet depends on Argentina for food. This is all the more amazing when one considers that Argentina has only 41 million people, one eighth the population of the United States. In the early 20th century, the ratio vis-à-vis the United States was even smaller, and still the Argentines could outperform us on agricultural exports at times. Argentina, like the United States, had massive European immigration from 1870 to 1920. Large numbers of Italians, Germans, French, Jews, Welsh, Christian Arabs from Syria and Lebanon, Swiss, Basques, Croats, and Galacians from Northwest Spain settled in. There were even some Irish, English, Poles, Ukrainians, and Scandanavians, though in considerably smaller numbers. Blacks constitute only 3% of the Argentine genome, and most of those who carry African genes are now partly white through intermarriage. The chief nonwhite minority are the indigenous native Indians, who constitute about 19% of the Argentine genome. On a genetic level, Argentina may be more "European" than we Americans, though tending more to the Mediterranean than the Nordic. About half the population has traces of Indian blood, but even these often pass for swarthy whites. For all intents and purposes, Argentina, until recently, was a white European country, and boasted of it. The real shocker is that Spanish-speaking Argentina may have more Italians than Spanish, which is why they say ciao (which they spell chau) rather than adiós. It also has a liberal constitution roughly based on the American model.